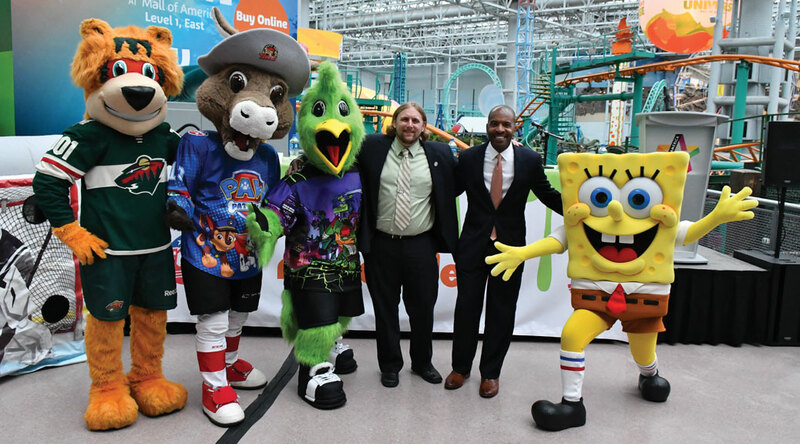 The ECHL (East Coast Hockey League) has announced that the League has partnered with Nickelodeon to host a “Nickelodeon Takeover Experience” at 26 home games during the upcoming 2018-19 season! The announcement was made yesterday (Monday 24th September 2018) at Nickelodeon Universe at the Mall of America in Bloomington, Minnesota. Teams will be able to choose from popular Nickelodeon properties including Rise of the Teenage Mutant Ninja Turtles, SpongeBob SquarePants, PAW Patrol and NickSplat, the network’s multi-screen destination dedicated to Nick’s legendary library of hits from the ‘90s and 2000s, as the theme for their designated game. As part of the experience, OT Sports will produce a set of Nickelodeon-themed jerseys for teams to wear on their selected night, and teams will build their in-game promotions around the characters of their choice. Began in 1988-89 with five teams in four states, the ECHL has grown into a coast-to-coast league with 27 teams in 20 states and two Canadian provinces for its 31st season in 2018-19. There have been 641 players who have gone on to play in the National Hockey League after starting their careers in the ECHL, including 18 who made their NHL debuts in the 2017-18 season. The ECHL had affiliations with 26 of the 31 NHL teams in 2018-19, marking the 22nd consecutive season that the league has affiliations with at least 20 teams in the NHL. Further information on the ECHL is available on its website at ECHL.com as well as on Twitter and Facebook. More Nick: 'Blue's Clues' Reboot Finds New Host in Broadway Actor Joshua Dela Cruz! Originally published: Tuesday, September 25, 2018. Additional sources: Wikipedia, The Journal Gazette. Follow NickALive! on Twitter, Tumblr, Google+, via RSS, on Instagram, and/or Facebook for the latest Nickelodeon and NickSports News and Highlights!